If you're a cat owner, the term "thinking outside the box" has an altogether different connotation. Probably, at some point, everyone who has owned a cat has had some unpleasant experiences with the cat thinking outside the box. I'm referring, of course, to the heartbreak of inappropriate elimination, as it's called in polite circles. 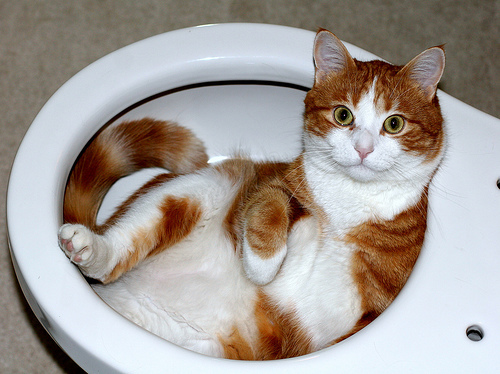 It's been a problem ever since man first invited felines into the cave and allowed them to go potty in a designated area. I've helped a few people address that problem over the years, so I thought I'd share this one with you. A couple said their cat was just starting to go outside the box. After a physical exam came back normal, I asked the couple a bunch of questions. As it turns out, they kept the litter box in the basement and when I asked about any sudden noises such as a furnace or sump pump starting up, a light bulb went on. They lived in a condo and often, when a new neighbor's washing machine went into the spin cycle, it would "dance" around the floor making a racket that could be heard in their own basement. Perhaps on one or more occasions, the cat was scared away from the litter box. 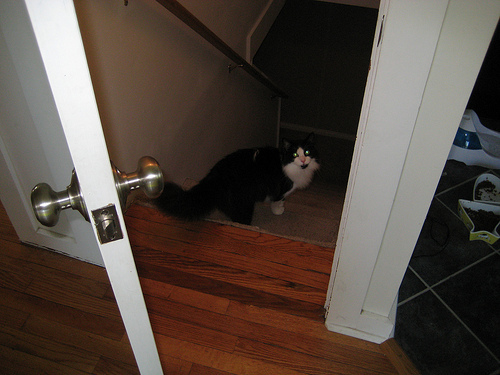 I suggested that, because of that experience, the cat probably considered using the litter box to be a scary thing. So they moved the litter box upstairs and the problem ended. I relate that story to illustrate just how difficult it can be to arrive at the cause, and how cat owners often have to think outside the box (in the human context, that is) to get to the bottom of the situation. 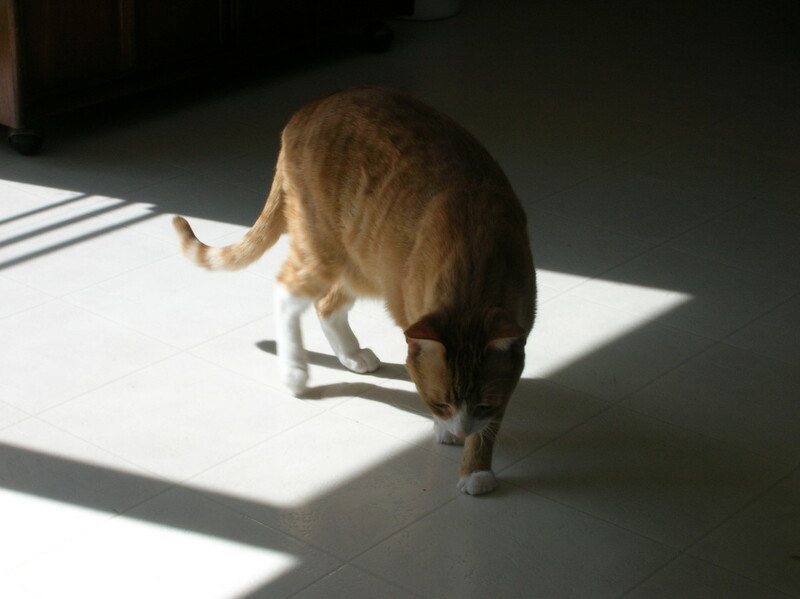 When a cat stops using the litter box it's because of a medical or behavioral problem. In the majority of cases, it's a behavioral issue, but the first thing you need to do is rule out a medical problem, so schedule a visit with the vet. 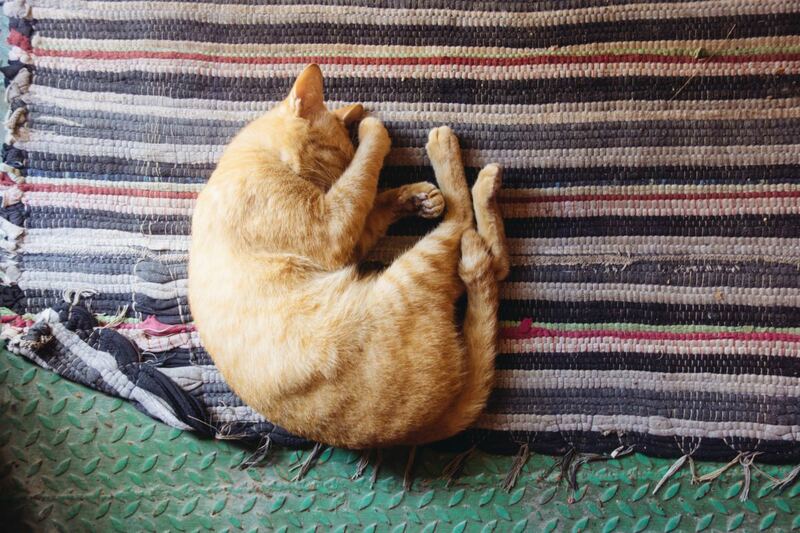 Often, when a cat is suffering from a urinary tract infection, or has crystals in the urine, there is pain upon urination. 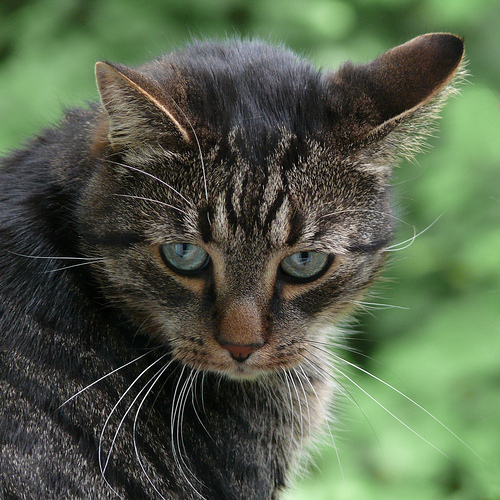 The experts say that the cat associates the pain with the litter box and stops using it. I wonder why they don’t associate the pain with any other alternate site they choose. If an exam by your veterinarian turns up negative, then you have to find the root of the behavioral issues. This is difficult to do. Many routine things we encounter during our daily life are taken in stride. But to a cat, they could have altogether different meanings. In general, cats like privacy and quiet when using the litter box, so anything, no matter how innocuous, that violates those requirements could cause them to avoid the box. By the way, it’s not out of modesty that they have these requirements. It’s out of vulnerability. When you’re not at the top of the food chain, and you’re in the middle of a nature call, that's the ideal time for a raptor (such as a hawk or eagle), coyote or some other predator to take advantage of your vulnerability. And requiring quiet means you have a better chance of detecting the approach of a predator. Some cats also have a preference for surface textures. 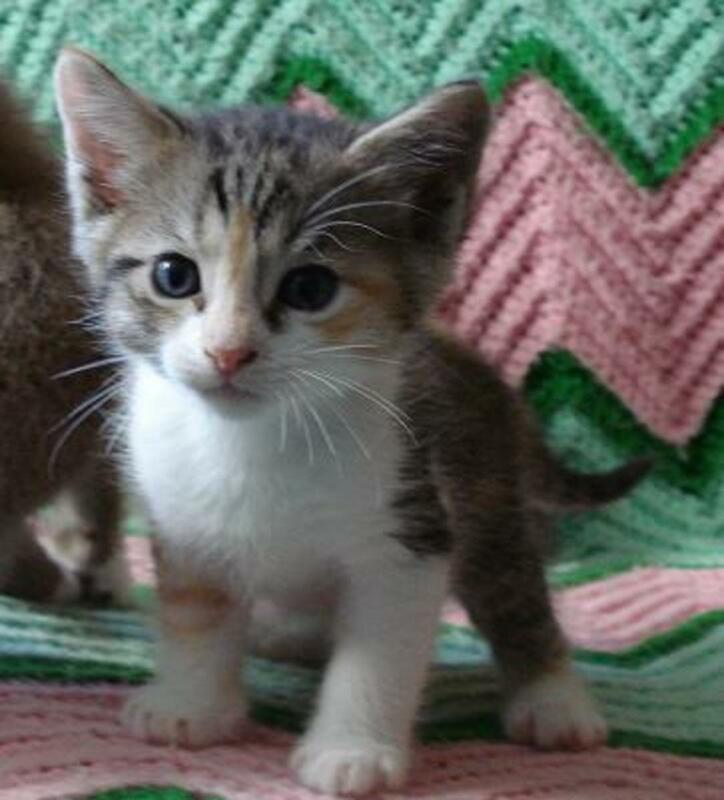 While most cats prefer a grainy surface such as that which litter provides, other cats may prefer a soft surface such as a carpet or clothing. Still others my go for a smooth texture such as that of linoleum, tile or cement. The litter, itself, may be a factor, resulting in litter aversion syndrome, or LAS. Cats with LAS may reject certain textures or aromas, the litter may not be deep enough for them to dig like they need to, or it may not be clean enough. Perhaps, if he's spent much of his life outdoors, he'd like the smell and feel of some earth mixed in with the litter. Sometimes it takes a lot of trial and error to zero in on the cause, so don't give up too easily. If patience is not one of your virtues, your veterinarian can ask the right questions and make suggestions, as can a certified animal behaviorist. C: they don't do it out of spite or as payback for anything. A. Since they don't understand our rules, and aren't well versed on the social graces of human society, it does no good to punish the animal. It won't make the connection since peeing and pooping are also ways in which animals communicate and establish territories. To them it's a necessary and positive thing. B. They'll often re-enforce their boundaries by keeping their scent fresh at a particular site. It behooves you to remove the scent. About the only way to actually remove the scent is to use an enzymatic product available at pet supply stores and vet clinics. Enzymes are molecules that consume organic matter. Such stain and odor removers may take time and repeated treatments, but they work. Remember that animals can smell echoes of bowel and bladder deposits, and cleansers just don't seem to be able to completely remove residual scent. C. There are no valid, universally accepted studies to support the notion that inappropriate elimination is done out of spite. The debate goes on as to whether animals, other than primates, are capable of such complex thought processes. If inappropriate elimination is a problem at your house, talk to your veterinarian about it. The good doctor knows what questions to ask and how to best approach a solution. Have You Ever Dealt With Inappropriate Elimination? Were You Able To Correct It? What is the best product to get rid of cat urine smell? In my opinion, the enzymatic products such as Nature's Miracle are the best. Enzymes are molecules that consume organic matter, so these products actually remove the molecules of urine residue rather than just covering them up. Follow the manufacturer's instructions on the bottle. In most cases, you use them full strength. They also work on blood, food and other organic stains on clothing, although you may have to check for colorfastness first. I have a 5 year old domestic short hair, we found in our complex, female that is indoor / outdoor,only pet. We thought it would be a great idea to get a Siamese male U TI. I have made separate beds built safe spaces with long shelves, separate towers, opposite of room . Felinaway.. Separate food areas, different eating times. He wants to play and she hisses. I'm sure both stressed . The male is peeing everywhere now. My clothes, my bed. I have 5 litter boxes . I cannot get him fixed until the infection clears up. My house smells so bad. I feel so ashamed to have friends come by. I have spent every last cent and still owe the vet for half of my last visit. I have a week. But I cannot buy anything else. My shop vacuum and dryer stopped working .And my washing machine is leaking everywhere, 3 months after warranty..
Hello, Tiffanyblue87. With 4 cats, the experts say you should have 5 litter boxes...theoretically one for each cat, plus one. 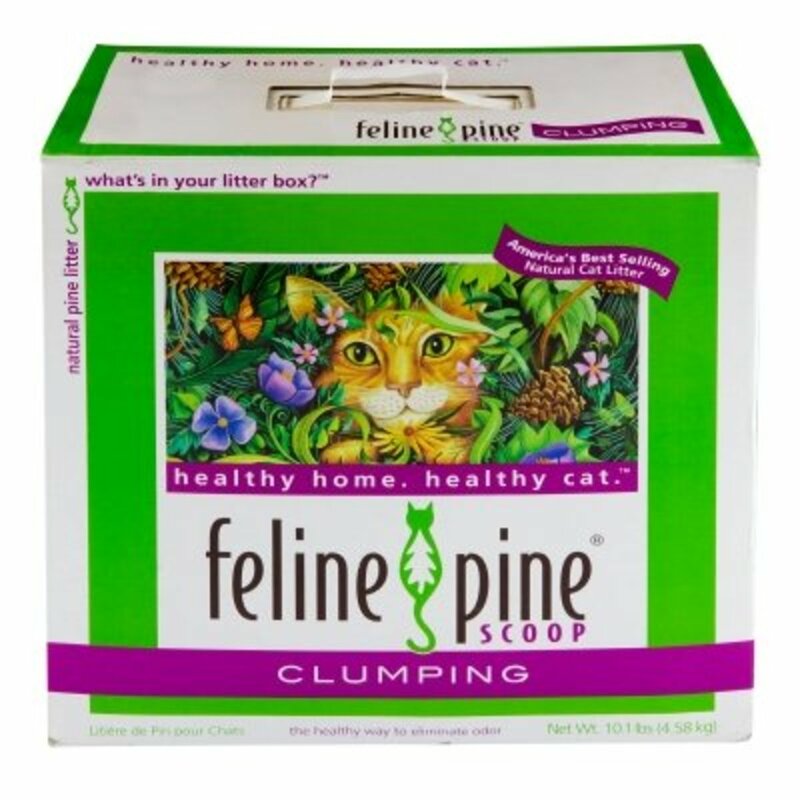 If you use the same litter in each box, try using one or two different litters. Try treating the garage spot with an enzyme, but don't drench the area...follow the instructions on the bottle. Drenching it may actually prevent the product from working. If you have an 8 oz glass but try to pour a quart of milk into it, the glass won't do it's job. I wouldn't paint over it. The scent will likely still be detectable by the cat. If the cat is healthy, you may never find the actual reason for this behavior. 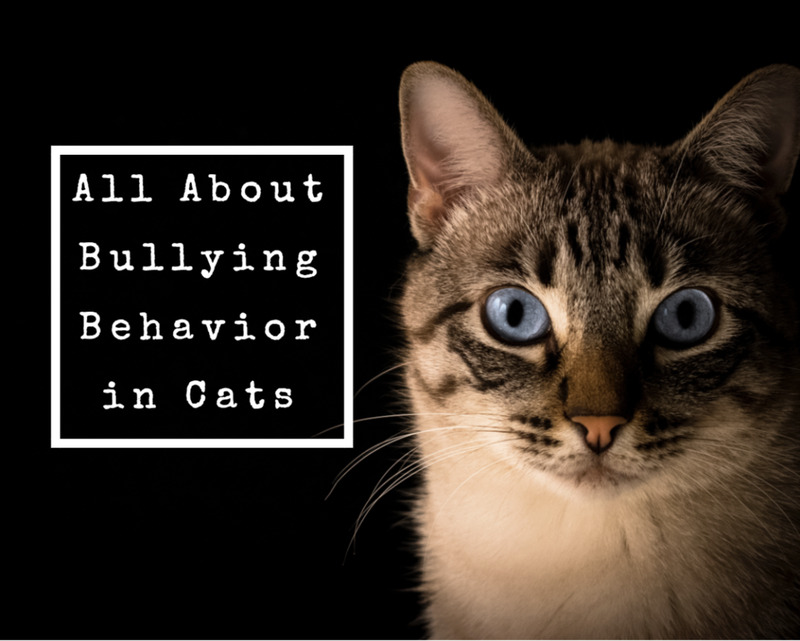 It could be a complicated social problem because he's one of 4, and cats are solitary by nature, or it could be some stupid little thing most people would never think of. I wish you luck in coming to a solution and thank you for stopping by to comment. So I live with a roomate in a large house with a garage. She owns 2 cats and I own 2 cats. All 4 neutered males. Youngest about 3, oldest is 10. There was a female spayed one about 14 yrs and she died from heart issues. She was our originap problem from the get go, she LOVED outdoors but was allergic to everything she woukd chew her fur off and eat at her own skin til it bled. We were getting allergy shots for her and stopped letting her outside completely. She NEVER used the litterboxes. She would always go right in front of it on the garage floor. When we stopped letting her outside the accidents got worse, blankets, beds, towels left on the floor, rugs. We started closing off bedrooms, not having any more fabrics of any type on the floor or on anything. She started using our leather sofa. We had to toss it because it went all inside underneath, then she started using the recliner, same thing. We covered out last couch in a plastic cover. She started to pee underneath a wooden desk by its leg and ruined the desk. That wasnt fun. Her favorite spot to go was in front of the AC unit in the garage. We left a plastic bin cover there because she would just go right on the cement floor. So, she got real sick, declining and we had to put her down. Well someone kept up the tradition in peeing in her favorite spot in the garage. I set up a camera and caught my 10 yr old boy cat doing it. Now, ive tried an enzyme spray completely drenching the area for days, sticky pads. He will just walk right on the wet concrete squat and pee. He jumps over the sticky pads or kicks them away. We clean the boxes daily. He will walk right in there with all boxes cleaned and pee there. He still uses the litterboxes like normal. He doesnt care if another cat is using one, he only pees in this spot once and leaves it there. Once it gets cleaned (because its right next to the a/c and blows right into the entire house) he goes right back hours later, sniffs around and pees a little bit. He has never done this in all the places we have ever lived. Ive never had a bathroom issue with this cat and he never marked before. Ive had him since he was 5 months old. So what can I do? Should I kennel him and clean the area and maybe paint it over?? Any ideas? Hi Peter Geekie. I added a comment for you to that of Steph399, above, but it looks like it didn't attach. What I said was that I can't add anything more than what I said to Steph399. Inappropriate elimination is one of the most difficult of cat problems to solve because it could be caused by some dumb little thing that most of us wouldn't think of in a million years. They sure drive us crazy, don't they? Thanks for stopping by and commenting. Hi Steph399. If you have 4 litter boxes and the cats check out OK with the vet, you're dealing with a behavioral problem and anyone's guess is as good as mine. The dumbest things can drive them away from the litter box, and the reason may not even be directly related to bathroom issues. 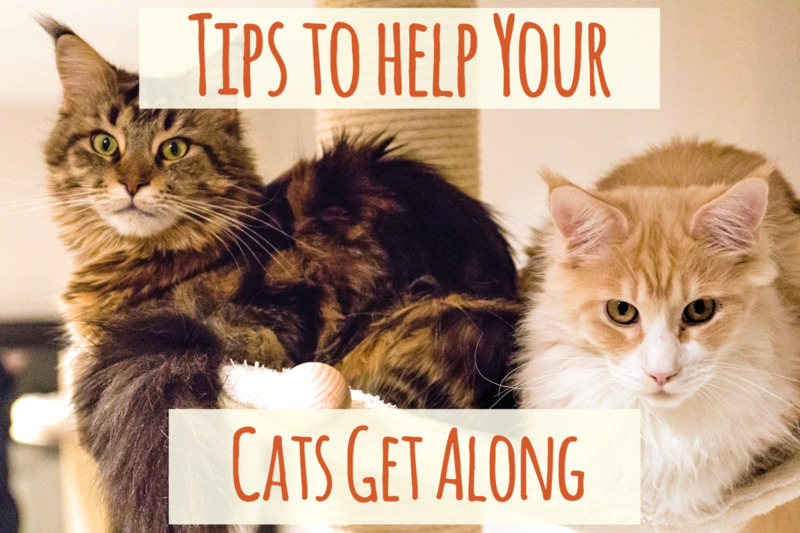 Sometimes talking with other cat owners who dealt successfully with the problem will give you some ideas to try. I wish you the best of luck. Thank you for a very interesting article. We have two siamese cats who on occasion pee on the bed rather than their boxes. I'm pretty sure it is a behavioural problem but can't pin down what. We've tried Feliway without success. Just about given up, but there must be a way. I do have 4 boxes. 3 in the basement and one in the enclosure that is attached to the house. Can anyone offer some help? It's a difficult problem, I will try my best to describe it. I have 3 cats all neutered males. One older, one in his prime and the 3rd is just a year old. The youngest had problems peeing outside his box in the past, which we were able to solve. Later he got a UTI and was treated. He did not pee outside the box during that time (may be semi useful info). The youngest is an indoor kitty (with outdoor enclosure). The two older ones were always indoor outdoor. Our community has been having issues with roaming cats so we had to keep the two older ones in as well. They were not happy with this! But it seemed they adjusted okay. Just recently the kitty in his prime has started peeing on every rug in the house. Not long after that the youngest started doing the same thing. I am at a loss as to what's wrong because the middle kitty never had issues like this. Its hard to tell if one is mocking the other and if so which one is having the initial problem? I have tried everything, calming sprays, increased attention to all of them, changing litter and buying new boxes, you name it I most likely tried it. I have cleaned with enzyme cleaner and yet they keep going back to these spots to urinate no matter what I do. It could be a territorial thing? But how do I fix that? It could be another UTI for the youngest (I'm going to call the vet tomorrow), but why is the other kitty acting the same? I will mention we have been doing renovations, building a sun room on the back of the house. It could be so many things and I don't know where to begin. By any miracle, does anyone have a similar story, and solved the problem? Hello Peter, nice to meet you. In a multi-cat household it's more difficult to find the cause of that one cat's inappropriate elimination. It could be the simplest thing...something that we don't give a second thought to, but that is important to the cat...or it could be a complex set of circumstances that we'll never figure out. You said that the litter you use is the best quality. No offense, but I say, "According to whom?" Your perception of its quality is irrelevant...the cat's perception of its quality is 100%! If there's something about the litter that the cat doesn't like, it's not going to use it. Period. I would make one more litter box available. 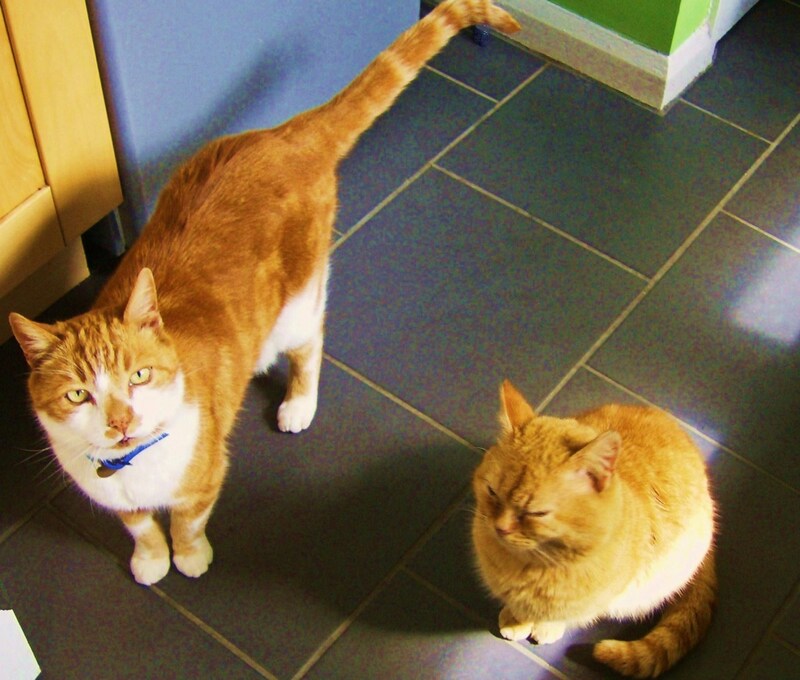 The experts on this side of the pond say one litter box per cat, plus one. If you have four litter boxes in use, that gives you room to experiment. Try putting that 4th box in a secluded area, use a different litter and notice who uses it...or doesn't. You can use that box as the test box for different litters until you find one that the offending cat will use consistently. 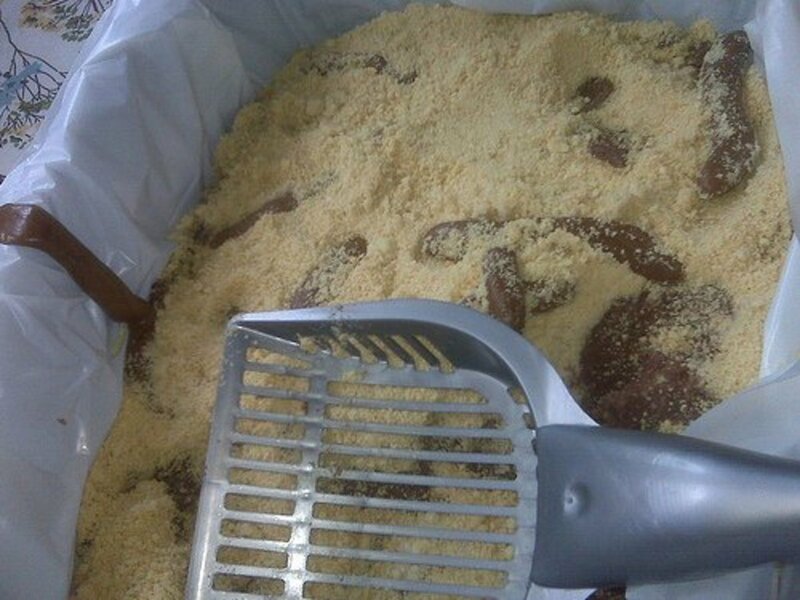 It might be a little expensive to keep buying litters to try, but hopefully, you will eventually find the right one. Then, you'll save all that money on enzymatic cleansers! I have three Siamese cats, but only one will occasionally not use the box. We've tried making sure the litter is the best quality and always clean and that they have one enclosed box each, in different places. I don't seem to be having any success other than clear it up and remove the scent.